Even those who run a business sometimes try to take care of repairs and other building projects themselves in an effort to save money. If your commercial roof needs attention and you think the problem is minor, you may believe you can take care of it yourself. This is never a good idea, regardless of your ability. Getting up on the roof is highly dangerous, but there are other reasons DIY roof repair should never even enter your mind. Our Atlanta commercial roofing experts will explain why. You could invalidate your warranty. In many cases a warranty is a component of the overall price of your roof, however strict regulations apply when it comes to installation or use of the manufacturer’s products. Just one minor mistake, and your warranty could be useless. Improper installation. Depending on the material used, installation can be a lot more difficult than you might think. Even if you’re just patching a small area or replacing a few shingles, it’s impossible for the untrained eye to know if the job is done correctly – until it rains and you see the roof is still leaking. Why take the chance and have to call in the professionals in the end? You’ll probably spend less money by having it done right the first time. A future insurance claim for roof damage could be denied. Most insurance policies do not cover DIY repairs. This means that if you tackle a roofing issue yourself and have a problem in the future that your insurer would normally cover, it may be denied because of the fact your efforts to repair the roof could have contributed to the damage. You may be able to appeal the denial, but it’s anyone’s guess whether you would be successful. Is it really worth the risk? Regardless of whether it’s a small issue or a big problem, it is always better to have highly qualified professionals with the necessary credentials when it comes to your roof. You won’t have to worry about a future claim being denied, the warrant being voided, or poor workmanship. Most important of all, you won’t be at risk of falling off the roof. 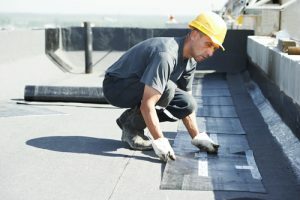 From small repairs to new roof installation, Kelco is an industry leader in commercial roofing for Atlanta businesses. Your roof is what protects your building and all that’s inside; put it in reliable hands. Give Kelco Roofing a call today and enjoy peace of mind knowing you’ve made the best decision.